After our failed attempt to see anything of the Domincan Republic (DR) on a cruise last year we decided to fly down there for a week while we were staying at our house in Florida. Go here for a picture gallery. Our flight from Miami on American Airlines was excellent on a brand new plane later identified from the internet as a 737 Max 8, the same model as the one which crashed in Ethiopia a few weeks after our trip. American Airlines has 24 of them. 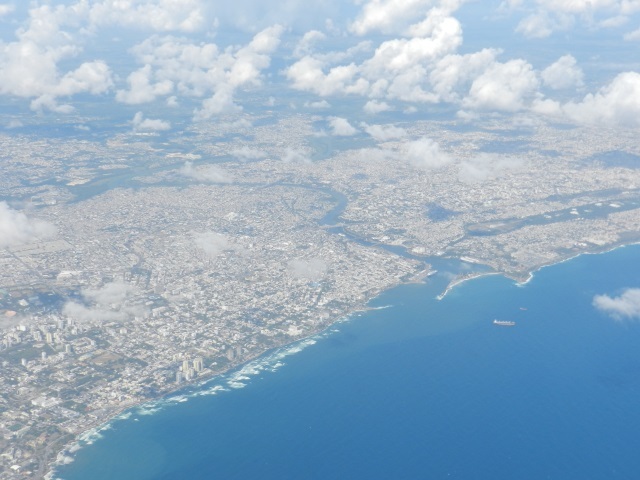 We spent two nights in the capital Santo Domingo. I had not realised before how old some of the buildings there are, and how important Christopher Columbus is in their history. 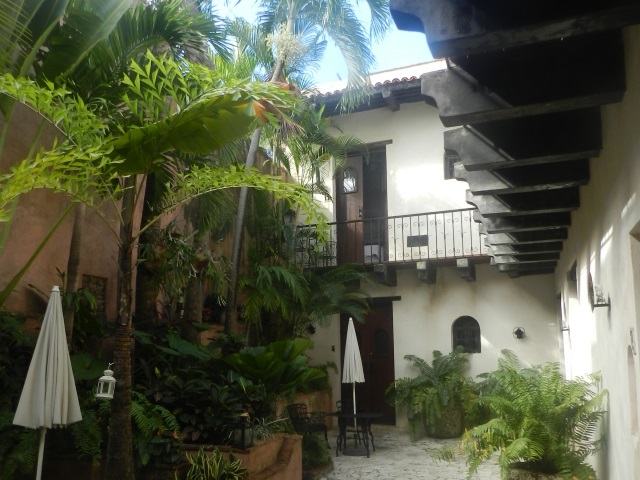 Our hotel El Beaterio had once been a convent built in the 16th century. The rooms surrounded a pleasant courtyard. We were right in the Zona Colonial. We arrived mid-afternoon via a slightly hair-raising taxi drive from the airport. This was a fixed fare of $40 but the driver gave us his card and said he would take us back there for $25. On the first evening we just wandered round a bit and had a falafel dinner nearby. The next day was sightseeing in earnest. There was some competition as a German cruise ship was in port and in several places we had to battle past groups from the ship. 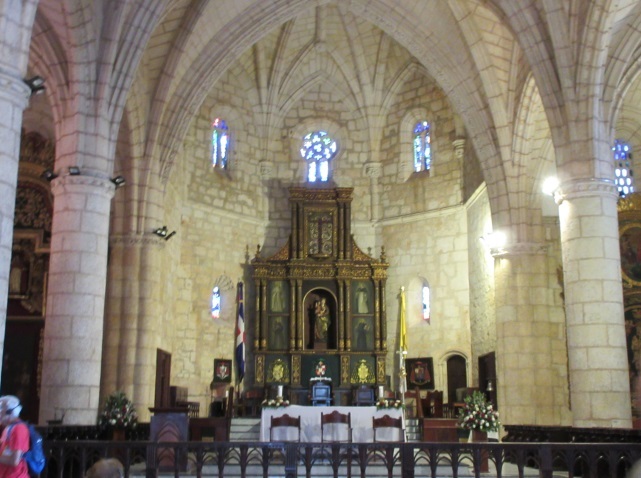 We started with the cathedral which was built in the 16th century and is the oldest in the Americas. It was beautifully restored for a visit by Pope John Paul II in 1992 and is light and airy in contrast to many Catholic cathedrals we have seen elsewhere. There were small chapels along both sides. One contained a life-size tableau of human statues and animals. The humans had no faces. We were later to find out why. Next up was the fort overlooking the Río Ozama. 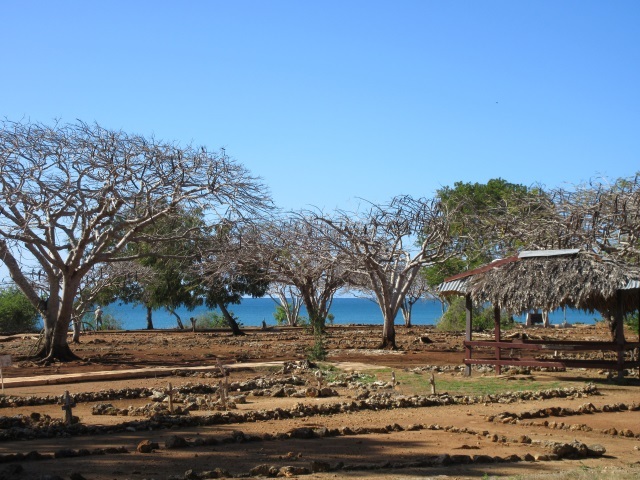 Construction began in 1502 and it is the oldest colonial military building in the Americas. The main part has good views and I liked the design of the information boards. There is not too much to see inside. We walked further up the Calle las Damas, which is the oldest street paved street in the Americas and got its name because the wife of Columbus’ son enjoyed walking up and down on it with her female friends. We briefly visited the Panteón Nacional which is a mausoleum with a soldier standing guard, never blinking as tourists filed past. 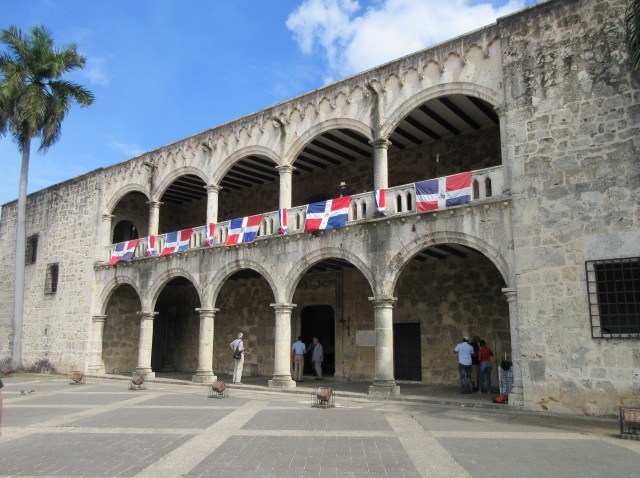 The Plaza España is the main square in Santo Domingo, although it is not an actual square. 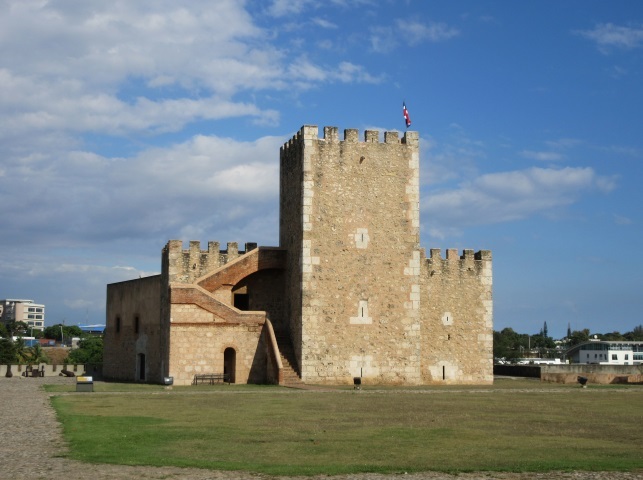 Its main building is the Alcázar de Colón where Columbus’ son Diego and his wife lived in the 16th century. This building contains furnishings of the period. Some of the items belonged to the Columbus family including a small trunk which I think the guide said was made of elephant skin. Then it it was time for lunch, a huge pizza in a nice restaurant overlooking the plaza. On the way back to the hotel we visited the Museo de las Casas Reales (Museum of the Royal Houses) which was also built in the 16th century and was the seat of Spanish government in Caribbean. 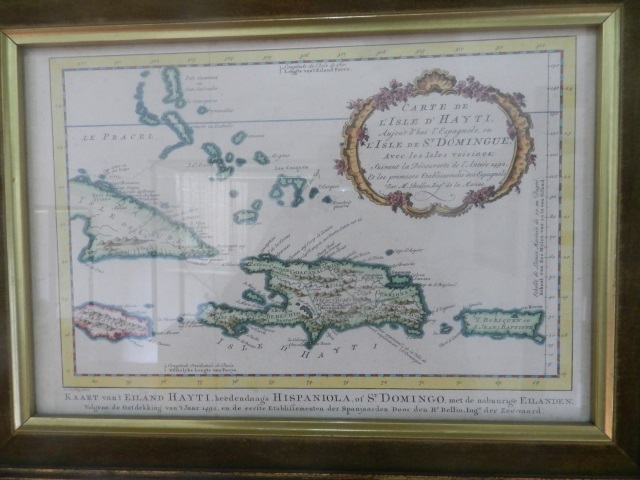 Of most interest to us were some maps of the earlier voyages of discovery, but there were also plenty of historical artefacts. After a rest we found we were only 2 blocks away from a long pedestrianised street with shops and cafes and more larger than life-sized human models with heads but no faces. Our hunt for the map shop listed in the guide book turned out to take some time, but during it we met up with a Canadian lady, now living in Florida, who was also planning to rent a car and needed a map. We had an interesting dinner in a rather up-market Dominican restaurant Mesón de Bari and just hoped the rest of the country would be a bit cheaper. With the aid of the hotel receptionist, we summoned the same taxi driver to take us to the airport to pick up our rental car. We had read fairly dire things about driving in the DR which has a reputation for dangerous driving and plenty of accidents. But we felt it was the only way to see some of country. Our car seemed OK and after photographing all the scratches on it, we set off towards the north east. To get there from Santo Domingo you have to go on an elevated so-called “expressway” through the city as they haven’t finished building the ring road yet. We found ourselves in an enormous traffic jam with cars trying to get on to the road at the many junctions by pushing (almost literally) their way in. There was no hard shoulder and finally, after well over an hour, we reached a car which had broken down. After that we were soon on the so-called “autopista” towards Puerto Plata. There was quite a hefty toll but people were wandering about by the side of the road. It was some time before we reached a cafe on our side of the road and had a very welcome coffee and a visit to a very clean loo. We had planned to take the ruta panoramica over the mountains to the north coast but had to divert to the shortest route as we were in danger of not getting to our next hotel in daylight. In the end we just had to drive about 20km along the coast road in the dark. 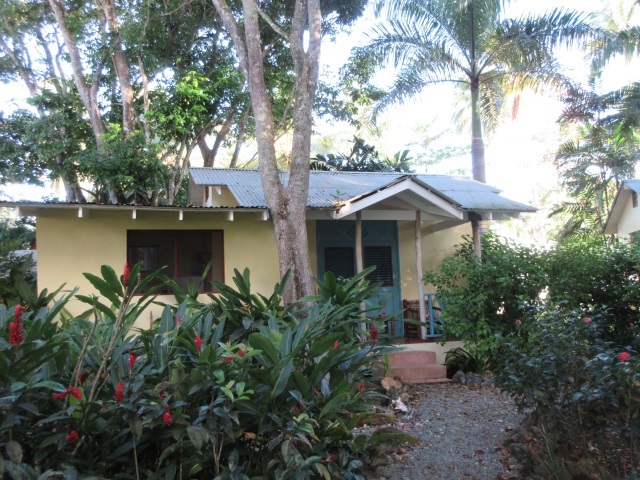 We stayed two nights at a bed and breakfast called Garden by the Sea halfway between Sosúa and Cabarete. The room was very good, as was breakfast, but as we only know the Spanish for scrambled eggs (huevos revueltos) we had to have our eggs cooked the same way on both days. 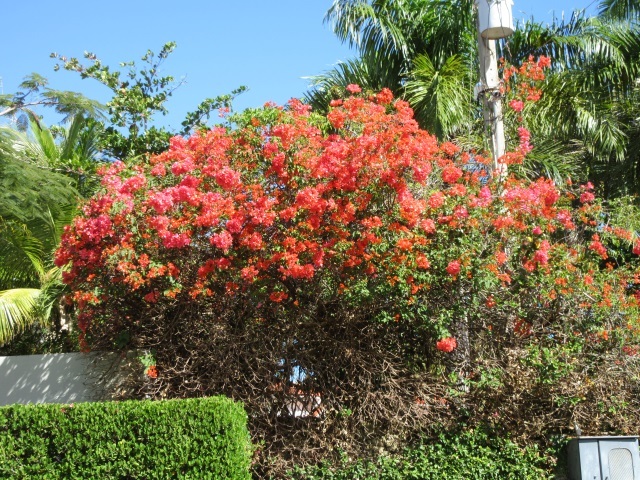 Here, as we saw everywhere in the DR, there were many bougainvilleas. It was about 100m from the B&B to Playa Laguna which was an empty beach lined by apartments. Our one full day in the northwest was taken up by a long trip westward to La Isabela, a settlement founded by Christopher Columbus in 1493. Driving turned out to be fine as there wasn’t much traffic. You do need to have eyes all round your head because there are so many small motorbikes dodging in and out. They were just like those we had seen in Vietnam a few years ago. We stopped for lunch (another pizza) at Puerto Plata in a restaurant on the malecón, which is the Spanish generic name for an esplanade running along by the sea. After some road works just past Puerto Plata it was an easy drive across some low hills to La Isabela where we found a neatly laid-out and well-tended archaeological site and a small museum. Columbus had picked his spot as it was a beautiful location by a small beach just inside a bay. One other couple was just leaving. There were no other visitors. Driving back was OK in the rush hour at Puerto Plata and we even managed to stop at a supermarket to pick up some food for the next day. At Sosúa we did something we rarely do which was to eat at the same restaurant on successive nights. There wasn’t much other choice near to the B&B and a Swiss-German restaurant called El Choco had a good choice of food. 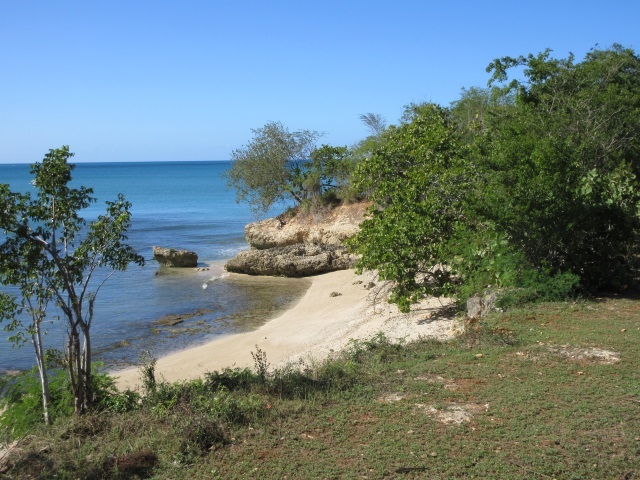 Our last three nights were spent at Las Terrenas on the north coast of the Samaná peninsula which is in the north-east of the DR. Getting there on a Sunday was no problem as the main road along the north coast was quite empty. 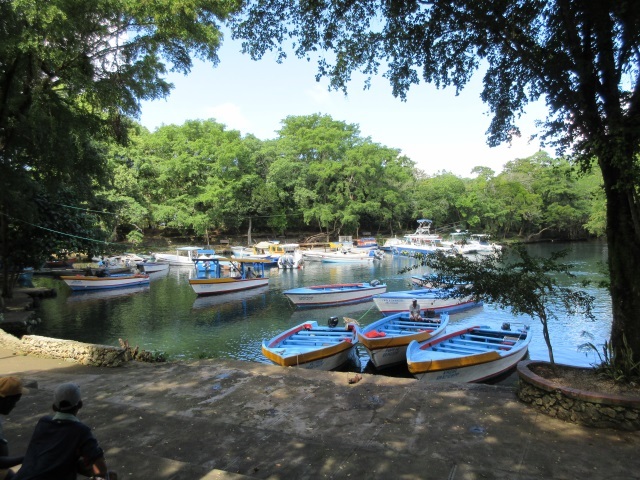 We stopped briefly at Río San Juan to see a lagoon with some colourful boats. Playa Grande, a beautiful sandy beach lined by trees and almost a mile long, was a good place for our picnic where I had company. 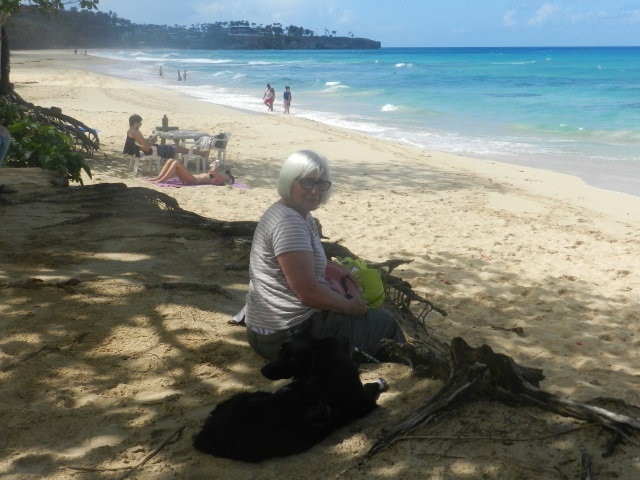 We didn’t encounter a single nasty dog anywhere in the DR, unlike many of the countries we have visited. Plenty of locals were enjoying Sunday there, but most of the beach was deserted. The last part of the drive was over a spectacular new mountain road (with a hefty toll), but the views were amazing. It reminded me of Hawaii with steep mountains covered in lush green and a variety of trees and vegetation. 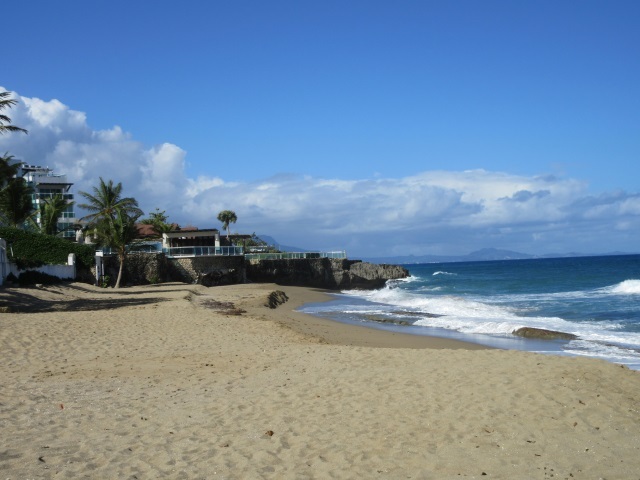 Las Terrenas has grown from a village around a small river into a major tourist area – this is not at all surprising as there are so many spectacular sandy beaches in the area. There is a complicated one-way system and hardly anywhere to park in the town. This area also turned out to be favoured by the French which meant one thing: good food. We stayed at the Iguana Hotel, a group of bungalows run by a French lady where the breakfast was wonderful. In the first evening we ate at a restaurant on the beach which was about 100m from the hotel. It was very quiet. On our first full day we set off to explore Samaná, going first to the El Limón waterfall in the middle of the peninsula. 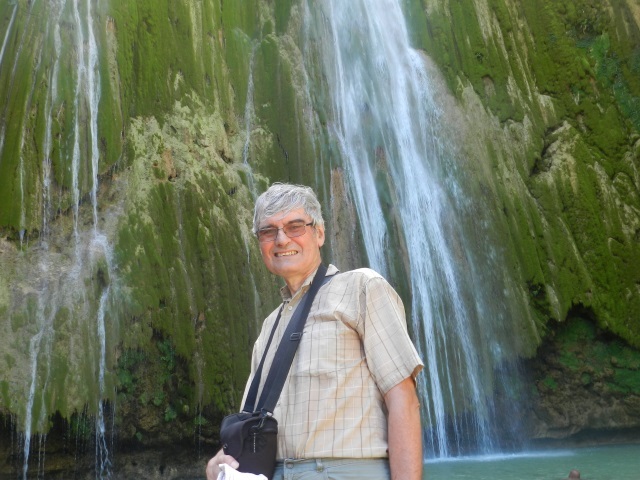 At least, Martin went to the waterfall which was a tough 2-hour round trip hike with a guide. I was looked after very well at the cafe at the start of the walk where we then had lunch of chicken, rice and fruit. After lunch we drove on to Samaná town on the south side, photographed an interesting church and then enquired about whale watching as it was in the middle of the season when hundreds of humpback whales come to Samaná Bay. The news from the whale watching company was not good. They had only one trip going on the next day which was already full. It was going to be rough and we would very likely be seasick. Since we had seen these whales before in Hawaii we were not too bothered about this. 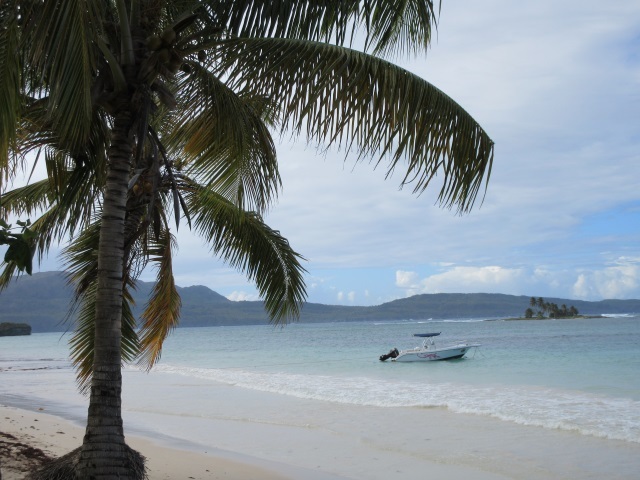 We drove on to Las Galeras at the end of Samaná where there is also a substantial French influence and where we found a nice cafe/patisserie. On the way back we did just see a big splash in the bay which must have been a whale. Ignoring a road closed sign we found our way back on a road along the coast, which was under construction but not closed, thus avoiding the lengthy one-way system in Las Terrenas. Dinner was at Baraonda, another restaurant further along the road from our hotel towards the town centre. We waited almost an hour for our food. On the morning of our last full day we walked along the beach to the town centre, had coffee at Paco Cabana on the beach, then looked at the shops. Lunch was at another French place with a typically French set menu. We were the only non-native French-speaking people there. 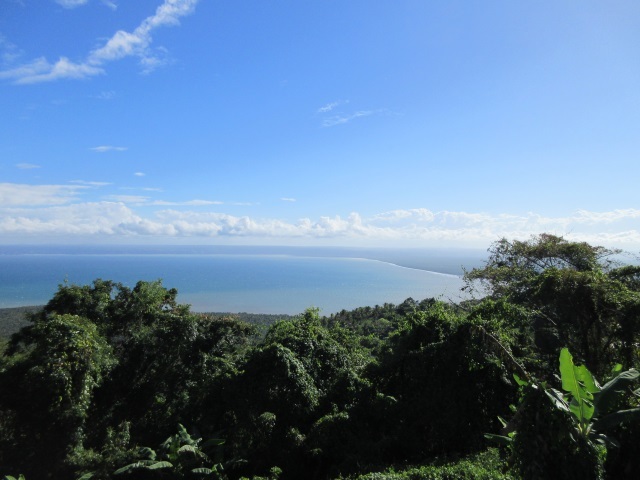 In the afternoon we took another drive over the mountains on a different route to the south of Samaná. We passed through plenty of villages and saw a number of small horses ridden by people who were rounding up cattle. Everything looked lush and green and there were some spectacular views from the mountain road and huge coconut groves by the sea. We waited in vain for a whale to surface off Samaná town. Then it was back past El Limón and along the coast road. Miraculously we found place to park in the town and had dinner at Paco Cabana by the beach. Highly recommended. The drive back to Santo Domingo airport next day on a good road was uneventful, but again expensive with more tolls. At least they are building some better roads now. If you look on the map you will see how few roads there are. The car had no more scratches and we had made it with no mishaps in this country of terrible drivers. We liked the country a lot. The mountainous scenery is quite something. Apart from the craziness of Santo Domingo outside the Zona Colonial, much of the country is rural with small villages. There are flowers everywhere. Almost every tiny house in a village has flowering plants – bougainvillea was the most popular. The people are very friendly and helpful and we saw nothing of the crime and traffic accidents which the guide books warned about. Santo Domingo was a very nice surprise. We knew there was some history there but had no idea that there was so much or that it was so old. The historical buildings were well looked after and included in the modest entry fee was an audio guide with a headset which was available in several languages. Outside Santo Domingo we found prices to be very reasonable and you can use a credit card with a pin number (are you listening, Americans?) almost anywhere. We didn’t need to buy much petrol but that was all easy too, with an attendant to fill the tank. The beaches are quite possibly the best we have seen anywhere in the world. There are just so many of them, all golden sand and kept clean. You can get by without knowing any Spanish, but a little knowledge helps a bit. 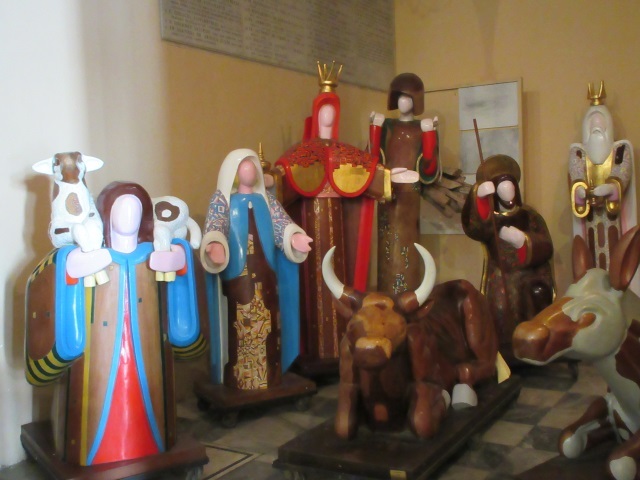 We finally solved the mystery of the faceless figurines when one shopkeeper in Las Terrenas told us that this was because there are so many different races and mixed-race people in the DR. But it’s then odd that some of the figurines we saw had black faces and others white ones. It was sunny or partly cloudy with a pleasant breeze all the time we were there – a contrast from cold rain when we landed in Miami. We would definitely go again especially as it is only a 2-hour flight from Miami, but perhaps not in a 737 MAX 8. Can anybody identify this tree? This entry was posted in Uncategorized and tagged 737 MAX 8, Alcázar de Colón, Cabarete, Calle las Damas, Chistopher Columbus, Cristobal Colon, Diego Columbus, Dominican Republic, El Beaterio Hotel, El Limón waterfall, fort Santo Domingo, Garden by the Sea Sosúa, Iguana Hotel, La Isabela, Las Galeras, Las Terrenas, Museo de las Casas Reales, Paco Cabana Las Terrenas, Playa Grande Dominican Republic, Río San Juan, Santo Domingo, Santo Domingo cathedral, Sosúa, Zona Colonial Santo Domingo. Bookmark the permalink.